Beverly Anderson Zieman was born Sept. 14th, 1926 to parents Frederick Elmer and Alyce (Lyckholm) O’Connor in St. Paul, MN. She graduated from East High School in Sioux City, IA in 1944 and attended the University of South Dakota. She married William R. Brandsma (deceased in 1953) and had two daughters, Linda Jean and Gayle Ann. In 1955 she married Melvin ‘Chi’ Anderson (deceased 1987), manager of the Cherokee Livestock Sale Barn. In 1992 she married Senator Lyle E. Zieman of Postville, IA (deceased 2003). Beverly was a bookkeeper for John Harvey and Co. at the Sioux City Stock Yards for 14 years before moving to Cherokee. She served as Cherokee County Auditor from 1968 to 1992, and was on numerous boards and committees throughout the state. She served as President of the Iowa State Association of Counties and was appointed chairperson of Iowa’s Mental Health Developmental Disabilities Commission. 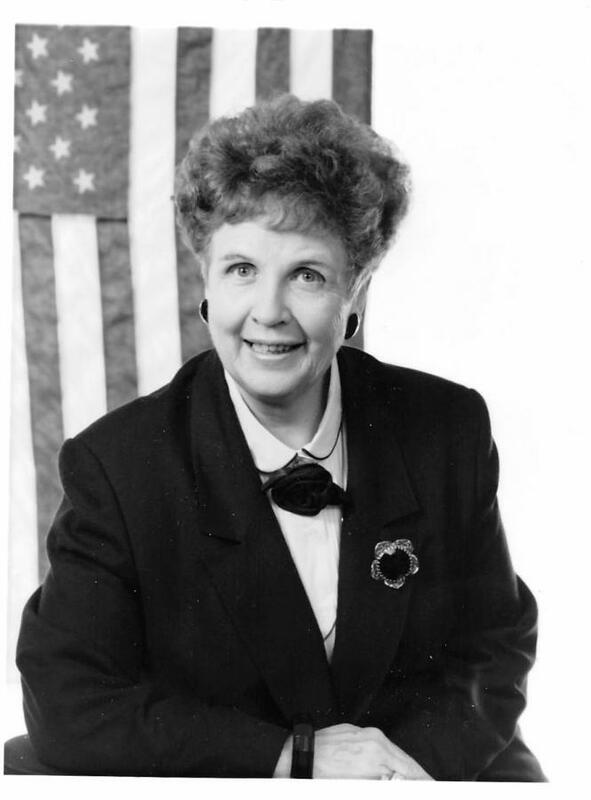 She was active in the Republican Party for many years; was Honorary Colonel for Governor Robert D. Ray and Terry E. Brandstad, worked closely with candidates George Bush and Charles Grassley, and ran for Secretary of State in 1990. She was a secretary for her husband Lyle Zieman in the Iowa Senate for eight years. She loved politics, reading, and playing cards. In 2006 she received the Business and Professional Women’s Award and was awarded Citizen of the Year in Cherokee in 2008. Lions Club, Kiwanis, Rotary, Postville Chamber, Cherokee County Work Activity Board, National Assoc. of Counties Board of Directors for Mental Health, WELCA, Whitehouse Conference of Economic Growth and Development, Wellmark Blue Cross Board of Directors, Iowa Paperwork Taskforce, Bacon Aquatic Center Board of Directors, Good Times Place Board of Directors, BLC Church Council, and the Cherokee Historical and Preservation Society. She was preceded in death by her father and mother Frederick E. and Alyce (Lyckholm) O’Connor and grandparents Mr. and Mrs. Charles Lyckholm of Vermillion, SD, aunts Mildred (Wayne) Saterlie of Mitchell, SD and Ethel (Clark) Gunderson of Vermillion, SD, brothers Jim, Mike, and Tom O’Connor of Sioux City, IA, husband Melvin ‘Chi’ Anderson of Sioux City, IA (married 32 years), husband Lyle E. Zieman of Postville, IA (married 10 years), and daughter Gayle A. Cedar of Cherokee, IA. She is survived by her daughter, Linda (Keith) Johnson of Hamilton, OH, son-in-law Jim Cedar of Cherokee, IA, sisters-in-law Mary O’Connor of Webster City, IA and Jean O’Connor of Sioux City, IA, cousin Carla Greenlee of Denver, CO, grandchildren Jenna Johnson of Mt. Vernon, IL, Todd (Shelly) Johnson of Hamilton, OH, Natalie (Jared) Barkley and Mike Cedar of Cherokee, IA, great-grandchildren Madison Johnson, Sam Buesking, Elise and Calista Erlandson, and Maddox Barkley, extended Family Mark (Jennifer) Zieman, Nile (Donna) Zieman, Jim (Lora) Zieman, of Postville, IA, Sue (Walter) Miro of Des Moines, IA, John Zieman of Tiger, GA, and many extended grandchildren and great grandchildren. Funeral services will be held at 10:30 a.m. Thursday, January 31, 2019, at Bethlehem Lutheran Church in Cherokee, Iowa. In Lieu of flowers, the family requests that memorials be made to one of the following that were dear to Bev. CRMC Hospice, Bethlehem Lutheran Church Memorial Committee, Rotary Back-Pack Program, Cherokee Historic Preservation Committee, Cherokee’s Relay for Life, Sanford Museum and Planetarium, Macular Degeneration Research, or WHS Educational Foundation. Due to the extreme cold weather, visitation will be held one hour prior to the service with the family present Thursday, at the church. Due to the extreme cold weather, burial will be postponed Thursday, and a family burial will take place on Friday.